Art & Dialogue is a national program designed to expand support for Artadia’s growing network of Awardees. Artadia currently supports over 325 Awardees working in a diverse array of disciplines in six cities across the country. Developed through in-depth research of artists’ needs, Art & Dialogue forges connections between visual artists, curators, and diverse publics in Atlanta, Boston, Chicago, Houston, Los Angeles, New York, and San Francisco through a series of studio visits, public programs, and online engagement. The program invites prominent national and international curators to visit Artadia’s six active award cities to conduct studio visits with Awardees and to present free public talks at Artadia’s many local partner organizations. All Art & Dialogue programs are documented, anthologized on Artadia’s website, and publicized internationally. Over a three day visit, visiting curators conduct one-hour studio visits with eight Awardees. 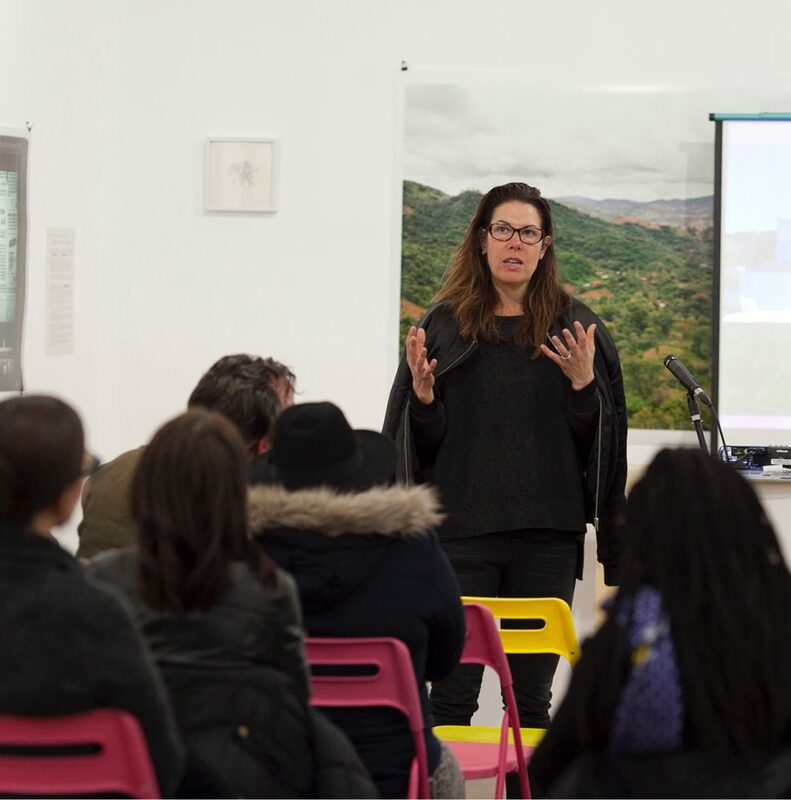 The visits offer artists an important opportunity to receive valuable feedback and establish lasting professional relationships with a curator representing a leading cultural institution. The studio visits also afford curators the opportunity to discover artists they might not have otherwise encountered during their career, exposing them to new artistic voices. Past A&D studio visits have led to inclusion in both group and solo exhibitions. Each visiting curator presents a free public lecture for approximately 200 people at a local partner organization. 2018 partners included Brooklyn Museum, New York; School of the Art Institute of Chicago; Atlanta Contemporary Art Center; Lawndale Arts Center, Houston; The Lab, San Francisco; and The Hammer Museum, Los Angeles. Artadia will work with the visiting curator to develop a program—either a lecture, panel, artist conversation, or some other form—that is timely and will benefit a diverse audience of artists, students, and members of the general public. This flexible structure allows curators to be creative with the form and content of their presentation in order to engage the broadest audience. The public program is recorded and shared online as part of Artadia’s efforts to create a national dialogue around contemporary artists and local urban communities. In addition to a video of the lecture, Artadia posts a written summary of the program on its website. Art & Dialogue is made possible thanks to the generosity of The Paul & Edith Babson Foundation, The Brown Foundation, the California Community Foundation, Chubb,The Fleishhacker Foundation, The Houston Endowment, The Joyce Foundation, MailChimp, the National Endowment for the Arts, and the Pollock-Krasner Foundation, as well as Artadia’s Board of Directors, members, and individual donors throughout the country. Curator of Modern and Contemporary Art, Virginia Museum of Fine Arts, at the Brooklyn Museum, New York. Curator of Contemporary Art, Crystal Bridges Museum of American Art, at the School of the Art Institute of Chicago, Chicago. Writer & Critic, at the Atlanta Contemporary Art Center, Atlanta. Artist and co-founder of Beta-Local, San Juan, Puerto Rico, at Lawndale Art Center, Houston. Curator, Whitney Museum of American Art, at The Lab, San Francisco. Dorothy and Stephen R. Weber (CHE’60) Curator at the Institute of Contemporary Art, University of Pennsylvania, at Carpenter Center at Harvard University, Boston. Chief Curator of TEOR/éTica, San Jose, Costa Rica, at the Brooklyn Museum, New York. Deputy Director, Exhibitions and Programs, California African American Museum, at the Museum of Contemporary Art, Chicago. Assistant Curator, ICA Philadelphia, at the Atlanta Contemporary Art Center, Atlanta. Senior Curator, Hammer Museum, at the Museum of Fine Arts Houston, Houston. Chief Curator, Museum of Contemporary Art Los Angeles, at The Lab, San Francisco. Independent Writer and Curator, at The Mistake Room, Los Angeles. Visual Art Curator, Portland Institute for Contemporary Art, at Skowhegan, New York. Executive Director, Museum of Contemporary Art Detroit (MOCAD), at Threewalls, Chicago. Founder, Director, Chief Curator, The Mistake Room, at Atlanta Contemporary Art Center, Atlanta. Sackler Center Curator of the Elizabeth A. Sackler Center for Feminist Art, Brooklyn Museum, at MFAH, Houston. Associate Director of Exhibitions and Programs, MoMA PS1, at The Lab, San Francisco. Associate Curator, Perez Art Museum Miami, at 356 Mission, Los Angeles. Assistant Curator, Perez Art Museum Miami, at MassArt, Boston. Curator, The Hammer Museum, at Atlanta Contemporary Art Center and Burnaway, Atlanta. Associate Curator, Renaissance Society, Co-curator, Made in LA 2016, at The Lab, San Francisco. Curator, Carnegie Museum of Art, at Threewalls, Chicago. Executive Director, Museum of Contemporary Art Santa Barbara, at MFAH, Houston. Associate Curator, UB Art Galleries, at the Rose Art Museum, Boston. Associate Curator, Guggenheim, at Los Angeles County Museum of Art, Los Angeles.